Today, its about Cats! Lots and Lots of Cats! 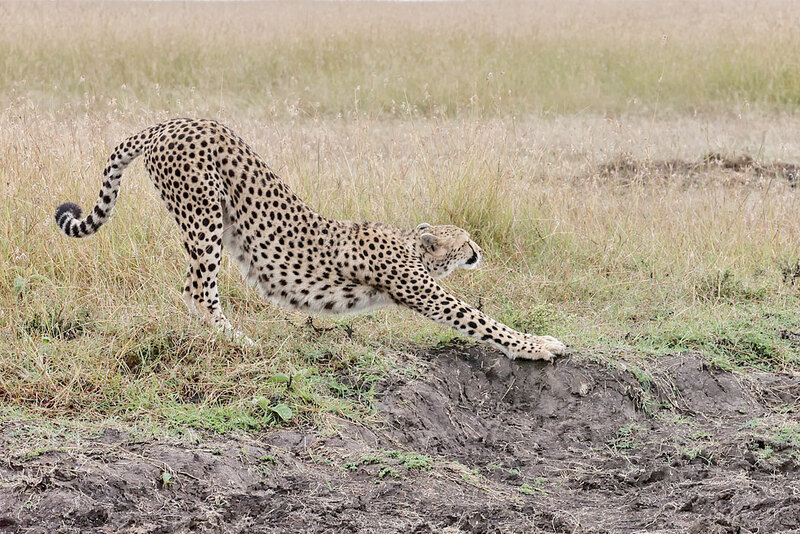 Note: all images on this blog are copyrighted property of Steve and Marian Uffman Nature and Travel Photography Per our normal routine, our Ngare Serian hosts wake us up at 5:45 am with a soft good morning, a pot of coffee, a pot of tea and a couple of granola bars. The rain of last evening made for a restful sleep-although I must admit I missed the grunting hippos in the Mara River which is at our doorstep. Quickly we dress, gather our gear and head over the suspended pedestrian bridge to meet Dennis and Dominick. The bridge is just barely wide enough so when I cross I don’t catch my back pack. For me, the bridge adds to the sense of adventure. For my wife, its a time to sweetly sing “Jesus loves me, this I know” as she makes her way across. Once we reach the other side of the river, Dennis and Dominick are there with the giant smiles asking us of our plan for the day. So far our plan has been to trust the experts and they always have delivered and then some. Today, they suggest that we go looking again for the lion cubs and then see if we can find the leopard that so far has avoided us. After seeing those cute cubs at Leopard’s Gorge, who could argue. So we headed off as we had done yesterday. Well when we got to the gorge, there was no sign of the cats but as they say in Swahili, “hakuna matata” meaning no worries-and we certainly did not have any. 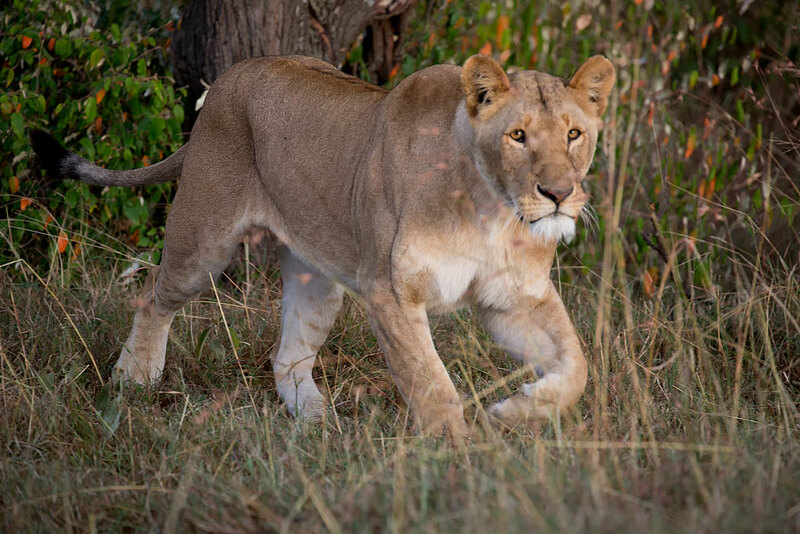 The plan was to move in the direction the lioness was headed yesterday morning. 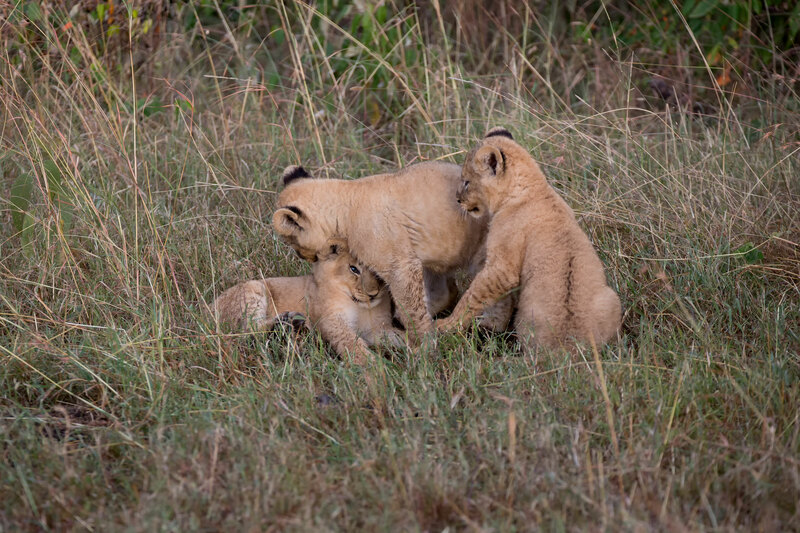 We know that lioness move their cubs frequently for safety reasons so this was no surprise. As there were no rocky outcrops ahead, we scanned the bushes and ravines thinking that might be where the lionesses and the cubs would be. 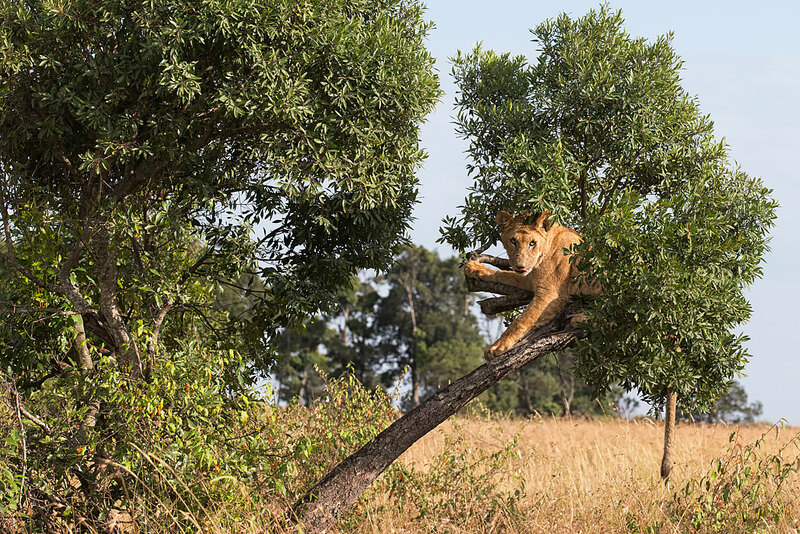 Little time passed and suddenly out of the bushes we saw one of the lioness come running. 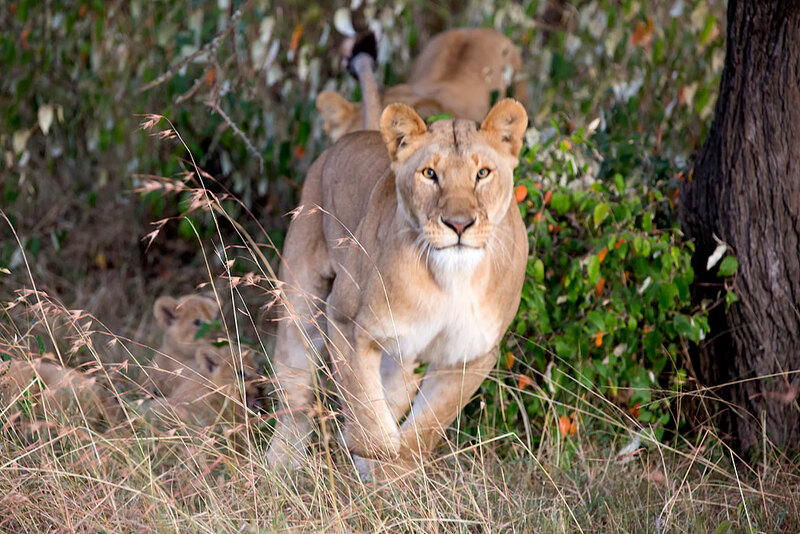 Certainly, gave us a start when she bolted from the brush, but the lioness was just leading the way for the other lioness and her cubs. Just as quickly as she bolted, she stopped, lifting her nose to the wind to sense if danger lurked by. 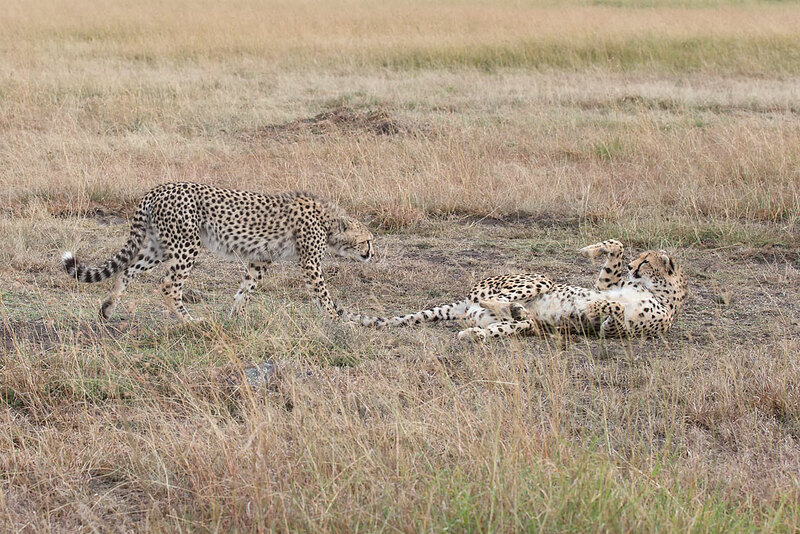 After scanning the horizon one more time, she gave the all clear low rumble and the mom and the three cubs appeared. The sweetness of the interaction of the cubs and the mother was very touching-leaving both us wishing we could join their fun. 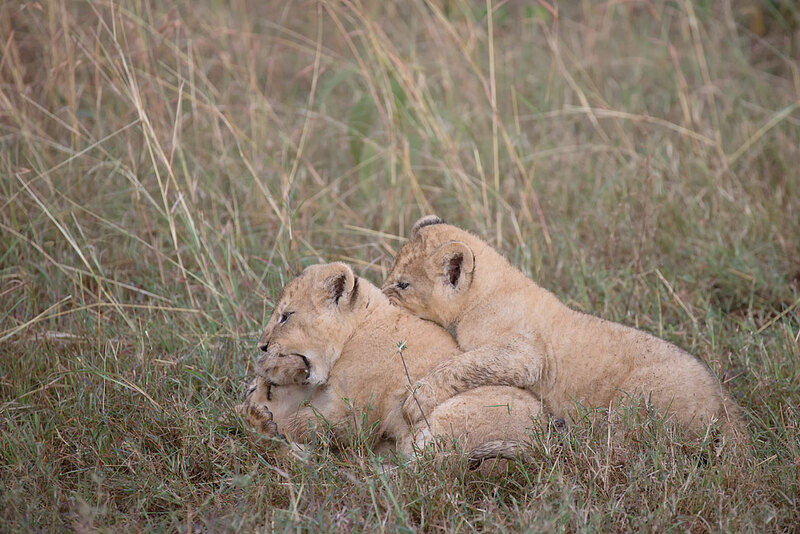 After a few moments of hugging and grooming from mom, the cubs soon moved off on their own. 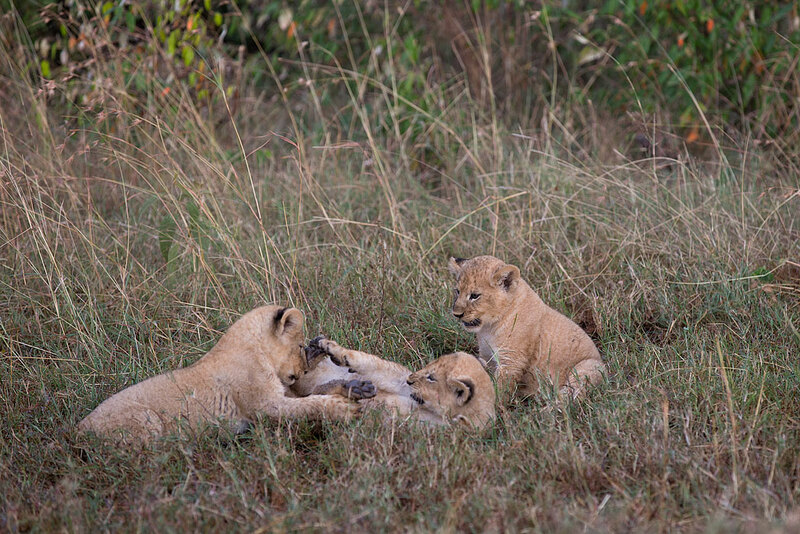 Time seemed to stand still as we watched the lion cubs play like young puppies. Everything was interesting to them. 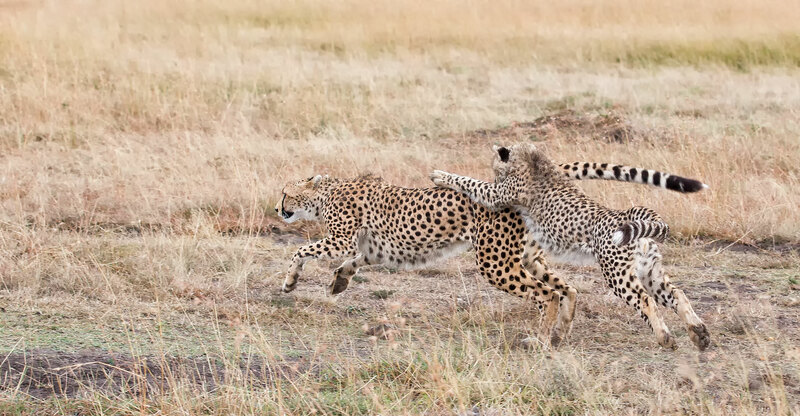 One moment they are playing tug of war with a stick, the next they are playfully wrestling with each other. Of course, it cannot be all play for the cubs. 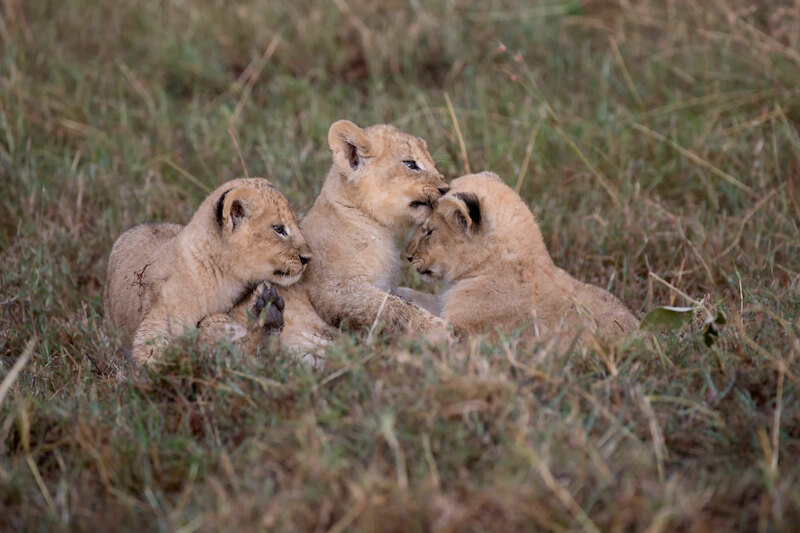 The lionesses know they much teach their cubs for them to survive. We marveled as we watch a tree climbing lesson. I was struck by a couple of ironies watching the cubs. How could something so small and cute become such a vicious predator at the top of the food chain? And how sad it was to watch them play and think about the difficult odds of them all surviving. I have no doubt that both Marian and I said a little silent prayer for their long term safety. As we watched for a few moments more, we knew we had made a memory that will always make us smile. But we knew we should not linger, so we backed away quietly and headed off to find the elusive leopard and have a bush breakfast. 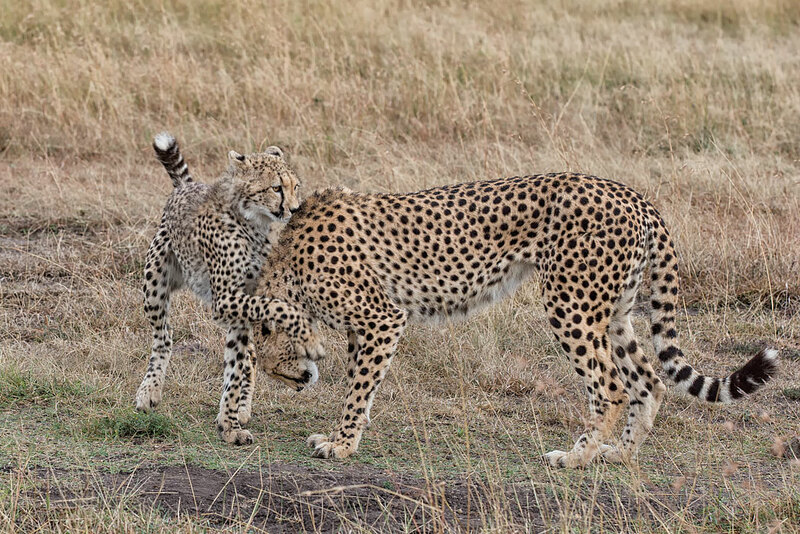 Surprisingly, after a short stop for a delicious breakfast we came upon the cheetah and her cub. How lucky can you get? This time they were not so sleepy. The clouds provided a coolness that seemed to boost their playfulness. 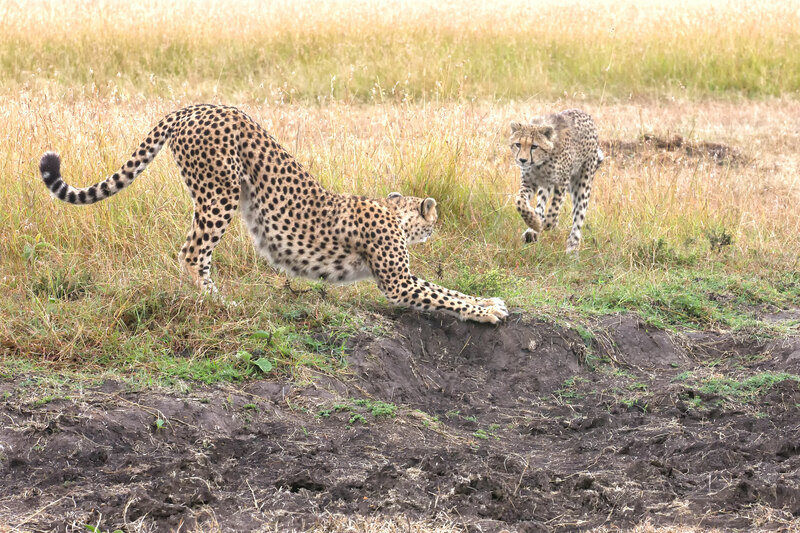 So we sat and watched as the mom and cub played chase, wrestled and more. 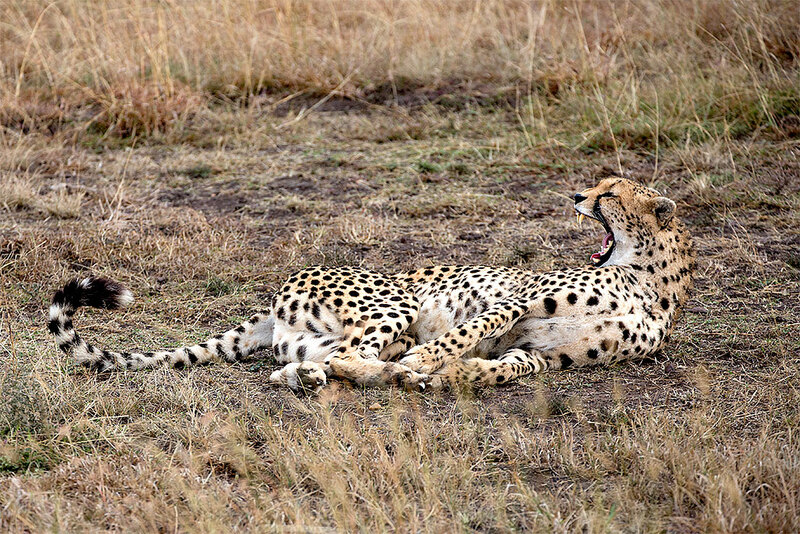 Well the cheetahs we saw yesterday resting in the shade sure put on a show for us today. Kind of feeling like we have been on a roll with Dennis and Dominick’s expert guiding. Hard to believe its still early but time to move on. We decide to go to a wooded area where a leopard had been seen recently. 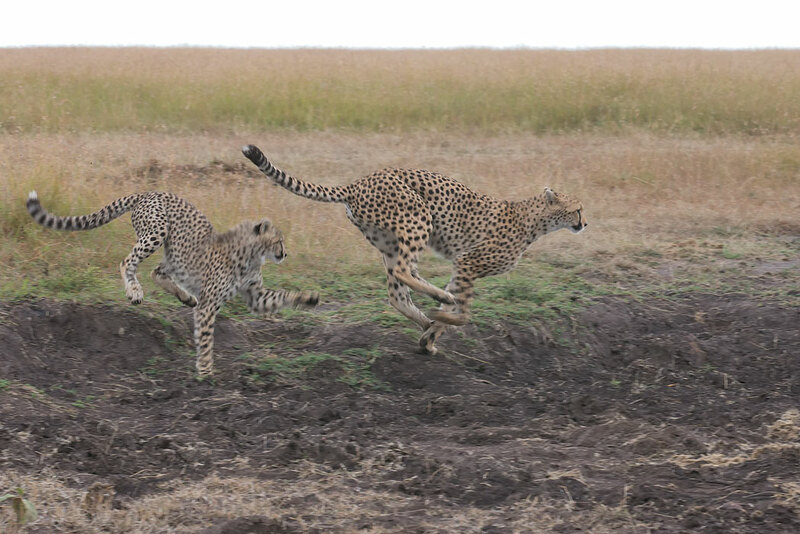 While the leopard has eluded us so far in Africa, we remain confident. But who can complain with the game sightings so far. 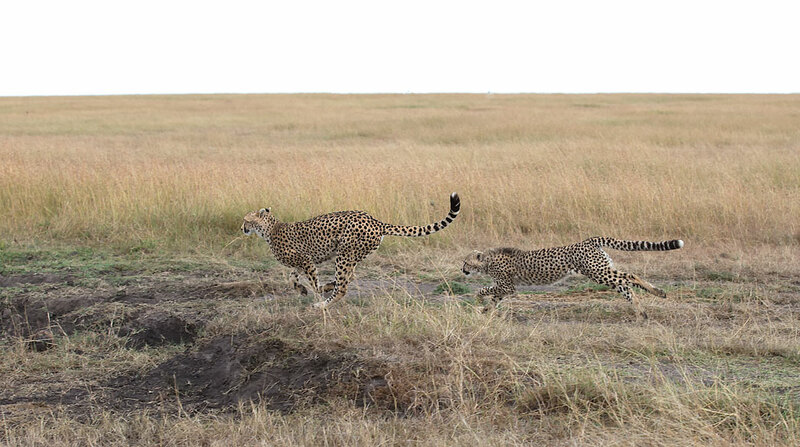 As we drive along we see zebras, warthogs, gazelles and more but we don’t stop as Dennis and Dominick are on a mission. After a short drive we arrive, an spot a lion pride resting in the shade. 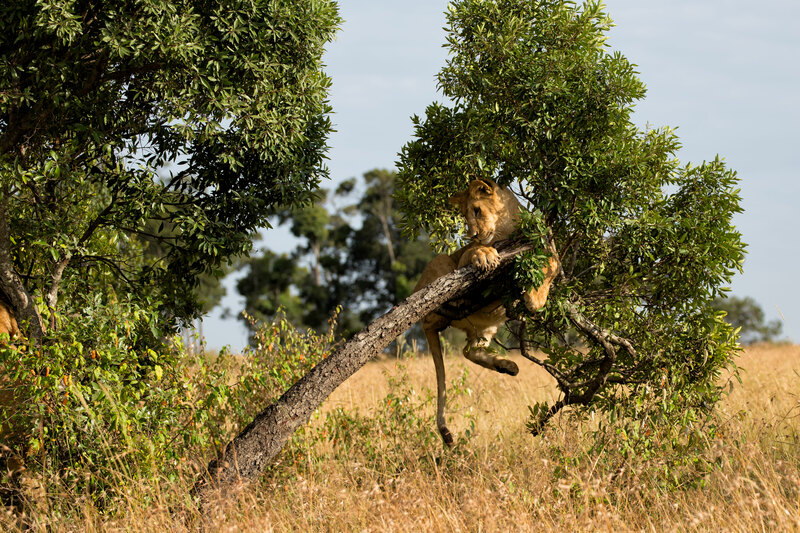 As we approach a teenage lion gets up and apparently decides to climb a tree to get a better look. Well teenagers learn as they go and this teenager was in for a big surprise. We watch the teenager climb up the leaning limb and wonder how long it will hold her. In a short while, another teenage approaches and decides it would like to share the perch. Hmmm, this might be entertaining! 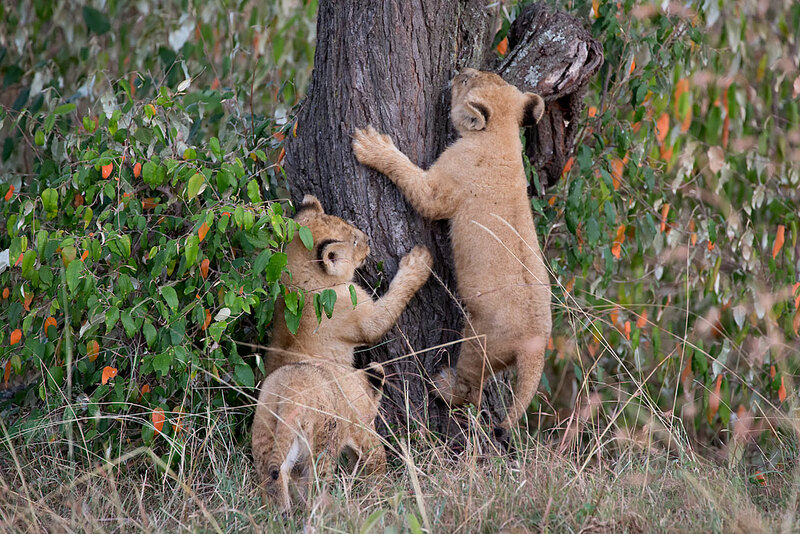 The first lion pretty quickly lets her sibling know that the perch belongs to her and her only-so the young lioness goes and finds a similarly fragile tree to climb. But that is another story. 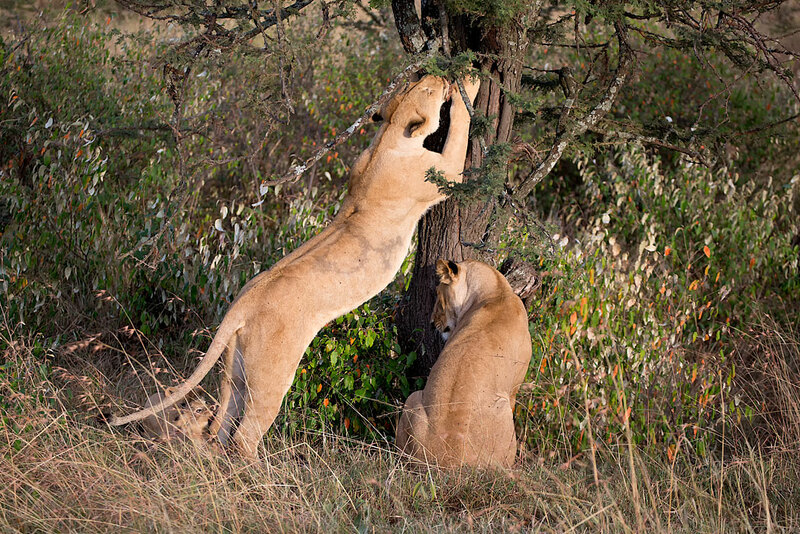 With a great deal of curious surprise to the teenage lion, the limb snaps and she tumbles to the ground. King (or Queen in this case) of the jungle? I think not for this lion today. Today has certainly been a marvelous day and its only a little past lunch. We decide to go back to camp and rest up for a bit before an afternoon search for the leopard. Bad news is that we did not see the leopard today- but we did see many spectacular things anyway. One last highlight before I close it down for the night. We saw many young babies of all different species including the young topi below. Great story telling with superb supporting photos. I’m impressed. Thanks for sharing your adventure. 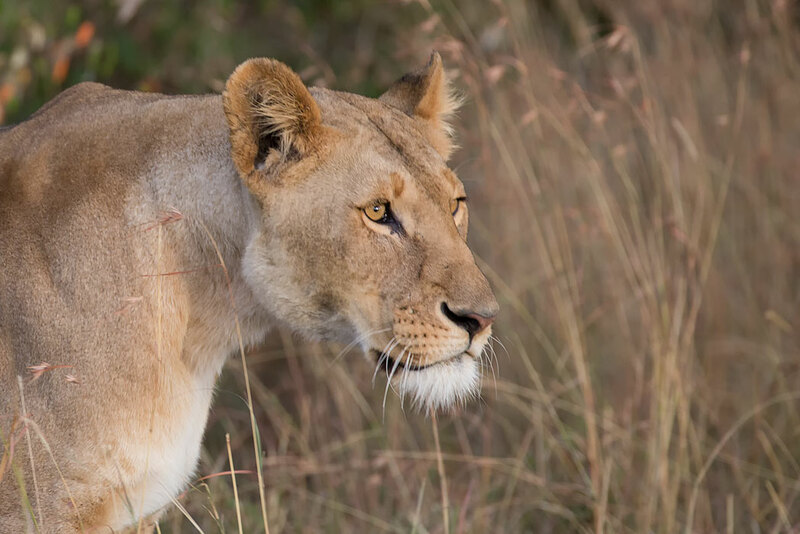 Are you serious when you suggest the lioness sees you eyeing her and doesn’t react, like a deer in a local park that is so used to humans it isn’t threatened? Craig, Glad you are enjoying. 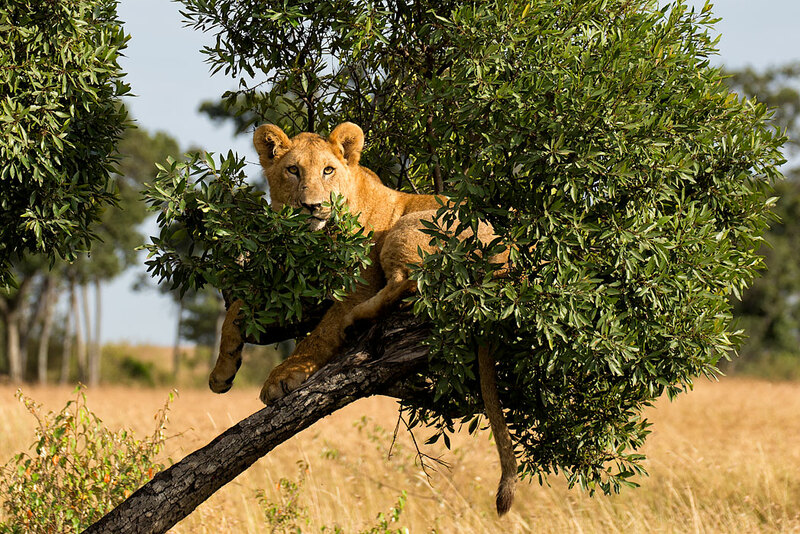 In many places such as the venues where most folks go for safaris in Africa, you can find animals that become habituated to humans in vehicles. We also saw different levels of shyness in the animals that seemed to depend on tourist density. And of course, we sought some areas that were not known for high volume of tourists. Staying in vehicles is important because the animals may act totally different if you are not. In fact, in Tanzania I swatted a Tsetse fly off my nose and knocked my classes outside the moving vehicle. We backed up to find them but took all sorts of precautions when I exited the vehicle-since it was in an area where animals were present. That being said you do take “bush breaks” and have “bush meals” outside the vehicle -but the areas are selected very carefully and are always in the wide open for visibility of a threat. Of course, there are some areas that offer walking safaris but the guide is usually armed. At most camps at dark, you are escorted to and from your tent-with in our case a Swahili armed with a metal spear. Africa is not the only place that has areas of habituated animals. The grizzlies we photographed in Alaska were at Silver Salmon Creek. The bears there are used to photographers but you always use caution. But these should not be confused with the grizzlies one might encounter in more rural areas where the bears do not normally see humans. Next year in November we head to extreme northern Canada to photograph polar bears. Many bears in that area are also habituated-but you are pretty much with an armed guide or are required to stay in the snow cat. This would be in contrast to an Oct 2013 invitation I have received from a member of the international photography community. The plan is to go on a private excursion to photograph polar bears in the upper reaches of the Northwest Alaskan coast. There the natives are allowed to harvest a few whales to feed their villages. The whale carcasses are then left on the ice for the bears and others to scavenge. The bears there would not be habituated and present both special opportunities and risks. There we would only photograph from a small boat.